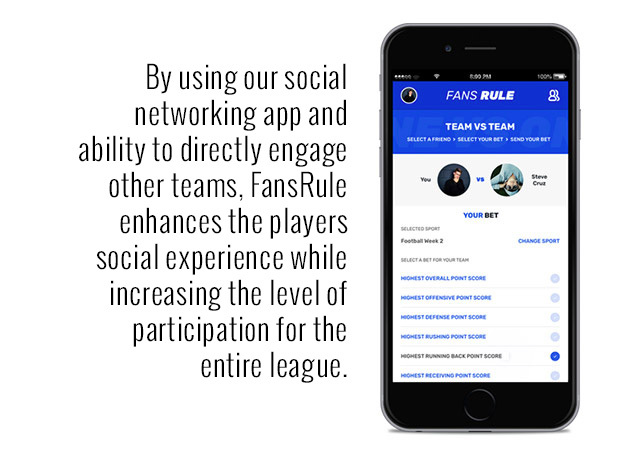 FansRule will fundamentally change the fantasy sports market by delivering the first social networking app that lets fantasy league teams compete against each other all season long. 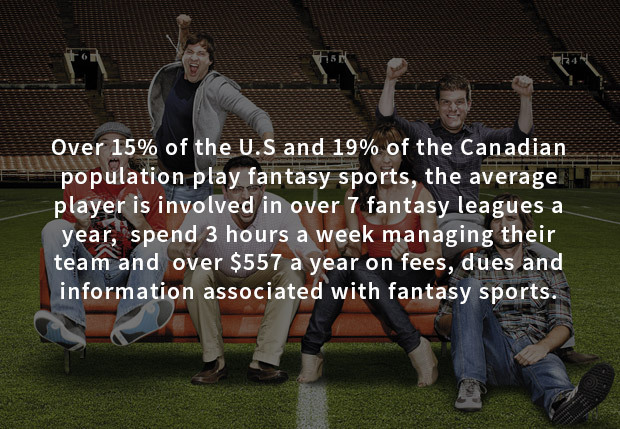 People join fantasy leagues as an enjoyable social activity and as a way to get more involved with the sports they love, as evidenced by the 57mm people who participate in fantasy leagues in the U.S. and Canada each year. The other and often more important driver for fantasy sports play can be attributed to the fact that many fantasy players crave the all important league bragging rights and the ability to particpates in cash awards and payouts. While most fantasy team managers remain engaged throughout the season and diligently manage their teams, many league managers lose interest during the season because either thier league does not offer contest or offer a very limited number. Leagues that do have contest have payout that are given out at the end of the season, so many teams in a league will not have a chance at any cash awards. This drop off in participation and social interaction can negativly effect a league and is a key reason why Fantasy Day Leagues have become popular as players look for more contest and ways to bet on fantasy on a weekly basis. 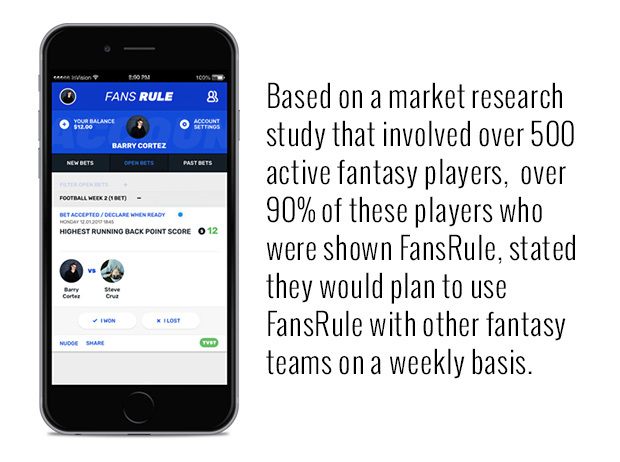 FansRule delivers greater engagement and participation for leagues, through the continual interaction that occurs when fantasy team managers have the ability to challenge and enter into contest with each other each and every week based on thier rosters performance. So regardless of a team’s standing every fantasy manager in a league can stay engaged all season long, win cash payouts and have braging rights each week. This increased interaction keeps team managers engaged all season, which enhances the fantasy experience for each and every teams in a league. Overview: FansRule provides all the functionality you would find in a social networking app like Instagram, plus a patent-pending gamming engine and banking solution. For each fantasy sport, FansRule provides a set of challenges and contest based on the statistical performance of a fantasy team. FansRule then manages the entire challenge or contest, ensurs funds are available before a challenge or contest is sent or accepted and then distributes the cash award to the team or teams who wins a specific challenge or contest. Teams can use their favorite sites including Yahoo and ESPN to determine the statistical outcome of a challenge or contest. An integrated leader board tracks all the challenges each team has participated in and shows cash awards won and lost by each team or league. Check it out for yourself at http://fansrule.us. Fantasy Sports We Support. The average fantasy player manages over seven teams annually. So when one fantasy season ends and the next begins, FansRule players can move right into the next fantasy sport season using thier same FansRule account. If there are sport season that overlap the player will choose the sport and the appropriate contests for that sport will be made available to the player. Team vs Team challenge (1-to-1): A fantasy league owner can send one of the many pre-defined challenges to league managers. Each challenge is between the team manager sending the challenge and another team manager who accepts the challenge. Any fantasy team who receives a challenge can accept, counter or decline. Once a challenge is sent and accepted funds are held until the outcome is declared by either party. Once the challange is declared and both players agree on the outcome, cash awards are distributed to the winner. Team to League contest (1-to-many): The contest can be sent to all league managers or a group of team managers in a league. Funds are pooled and then shared by the winning teams of the contest. The team manager submitting the contest is the de-facto commissioner who determines the contest, from a pre-defined set of outcomes, the number of teams, funds required to participate and the distribution of the cash award based on how teams place in the contest. Fantasy Sports Market: According to the Fantasy Sports Trade Association (FTSA), there are more than 57.5 million players in the U.S. and Canada who participate in fantasy sports annually. These players spend on average $557 a year on league fees and associated fantasy sports activities for an annual total of over $26B. In 2016 the NFL generated over $13B in revenue while the revenue generated by Fantasy Football players was over $12B, making the derivative fantasy market as large as the foundation market of the NFL. Market Opportunity: Over 96 percent of all fantasy players (53 million) play in a season-long league where teams are choosen at the begining of a season and manage the entire sports season. Today these team managers do not have the ability to challenge other teams or enter contest generaged by other teams in thier league. With FansRule players can now directly engage other fantasy managers all season long, as often as they like on the teams they manage, while significantly enhancing the overall fantasy experience for all the teams in a league. We’ve identified a significant unserved market opportunity in the U.S. fantasy sports industry, and we are readying our product (FansRule) for entry into the U.S. and Canadian market in the fall of 2017. Our initial release will target fantasy football, but as new season start: Basketball, Soccer, Baseball and Hockey players can easily migrate to a new league using FansRule. We also have plans to extend our gamming platform in the US as laws pertaining to on-line gambling change. Applications for Key Patents on more than 40 different process and flows have been submitted to the U.S. Patent Office. Funds raised are over $1.4M to date, new funds to be used for product release and customer aquisition and support. Fantasy Day Leagues: Day Leagues require teams to be choosen weekly and have no connection with the Fantasy leagues that 53M player form leagues are and manage thier roster i all season long. Fantasy day leagues (FDLs) such as FanDuel and DraftKings offer what is classified as pool contests, where players can play against hundreds of players on a single event. FDLs are similar to lotteries or sweepstakes, lots of entrants and few payouts. Most troubling is the fact that the average FDLs player is usally opposed by professional players who have access to highly detailed statistics and money that the average day league player does not have. These professional players on average take over 90% of all contest winnings while the average player looses their entry fees. 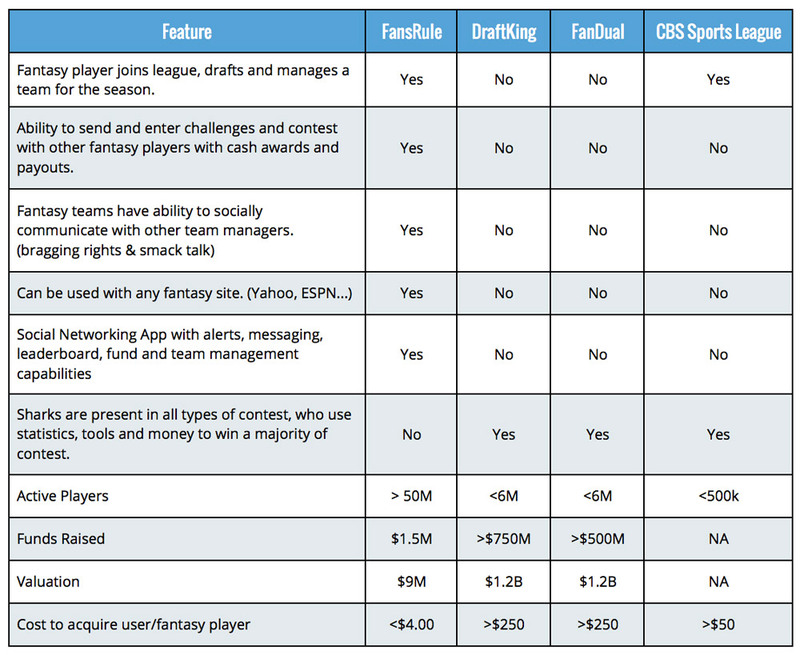 Yahoo and ESPN Sites: Fantasy sites operated by Yahoo, ESPN, CBS Sports and others allow individual players to sign up and join a league based on a predefined entry fee and cash awards. These sites have very few contest options, players must wait to the end of the season before cash awards are made and there is no social componet as players are randomly put into leagues and have no ability to communicate with other players. FansRule a Better Option: FansRule lets the 55M players who join leagues with freinds and family the abulity to directly engage in challenges and contest all season long. We also provide increased social interaction and participation that improves all teams experience in a league. Size of Day Leagues: The Fantasy Trade Sports Association (FTSA) 2016 statistics validates the FDLs issues, stating that only 12 percent of all fantasy players play in both FDLs and season long fantasy day leagues. In contrast, their research shows more than 88 percent of fantasy sports players (50mm) play exclusively in season-long leagues and manage their own teams, resulting in a significant opportunity for FansRule. Factor in the fact that FanDual and Draft King are fighting for the same customer base with the same product means higher fees for players going forward and fewer funds for payouts. 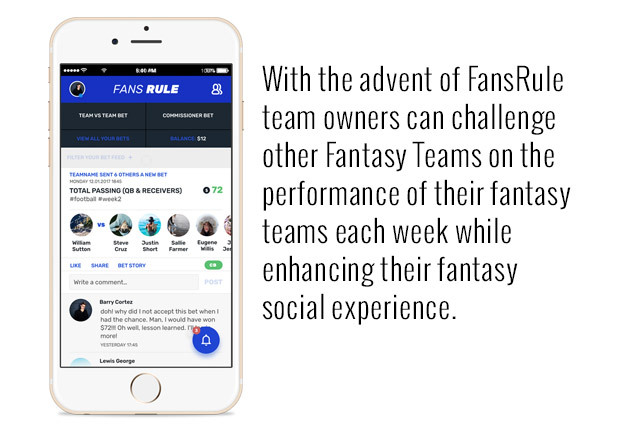 FansRule has the first-mover advantage, being the first-to-market with a social app enabling fantasy team owners to challange and enter contest directly with other league team managers based on the performance of their fantasy teams. Players determine who to challenge, contest to enter, amount of challanges and which to accept. 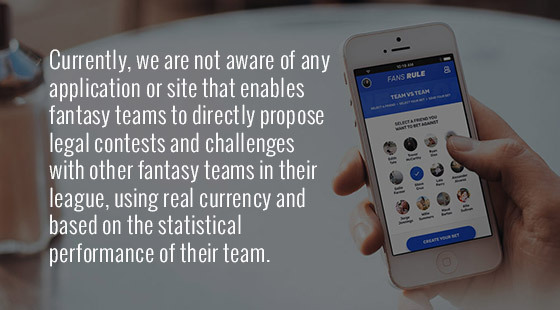 FansRule provides unique value add to the fantasy sports experience, elevating the league experience through greater social engagement and interaction in the form of user-friendly challanges and contest. Because FansRule is a social networking application, customer acquisition cost is significantly lower than other fantasy portals such as FDLs. When one player in a fantasy league downloads FansRule, they will immediately invite other fantasy owners in their league. This viral effect will drive greater customer engagement and retention rates, while keeping customer acquisition cost low. In stark contrast to fantasy day leagues FansRule players have close to a 50:50 chance of winning each time they bet. This significantly improves player retention and application usage rates with fantasy players. The familiar interface of a social app allows players to easily share their experience and results, further encouraging player engagement and new player acquisition. Our internally developed, patent-pending Social Gamming Platform (SGP) which facilitates the end-to-end process is quite unique to the market. Filed in 2015 the patent covers more than 40 different features specific to our gamming flow. While patents are not guaranteed to keep companies from entering market, we do feel patents are a significant roadblock and will increase our valuation. Want to learn more about the team, go to market strategy, revenue plans and what they have planned for the future? Make sure to request access to the Business Plan tab of the profile to find out how you can get involved!